Fatgirl Hedonist: Blue Bell Ice Cream GIVEAWAY! Blue Bell Ice Cream GIVEAWAY! It's no secret that I like hosting giveaways. 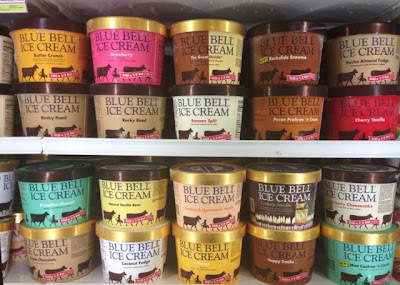 So when I was given the opportunity to host a Blue Bell ice cream giveaway, I jumped at the chance. 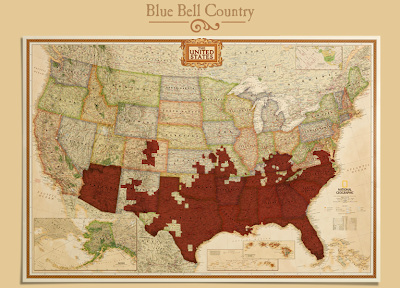 Blue Bell ice cream made it's way into South Florida in 2009 and has quickly become on of the most popular ice cream brands in the region. Personally, their cookies & cream and mocha madness are the best I've ever had. Blue Bell is a southern staple that is sold in only 19 states. Neat part is that even though this creamery is only available in less than half of the US states, it's still the third top grossing ice cream company in the country. So you're wondering what exactly am I giving away? Bueno... I'm giving away 4 (yes FOUR) half gallon ice cream containers. So make room in the freezer, because this is enough ice cream to hold you over for at least a week (if you're like me, that is). What flavors am I giving away? Well that's up to you. The winner can pick any four of their available ice cream flavors from their current list. Now here's the kicker, this giveaway is only available for residents living anywhere between Port St. Lucie to Key West! So this giveaway is only for my South Florida peeps. Winner will be selected on 08/16/2013! Register for the giveaway below, you may have to give the application a couple of seconds to load! Blue Home Made Vanilla is CRAAAAACK. Try it with sexlets. Favorite flavor?? Just one?? I can't. Two faves are banana pudding & cookies & cream. I need some gold ol' Dutch Chocolate! Please remove my entries. I didn't read the only available to Florida residents part. Sorry, I am half asleep. Should have paid more attention. I love any chocolate or cookies & cream flavored ice cream!! My favorite is chocolate chip cookie dough. I know, how boring, but DE-LITE-FUL. caramel fudge...... and all the others. GIRL! You won my flat iron give away. So it's only fair... I'm kidding! Mmmm Blue Bell Ice Cream is Deish! Have family coming in from NY, so would be great to treat them to some southern comfort!! oof, the birthday cake tho.